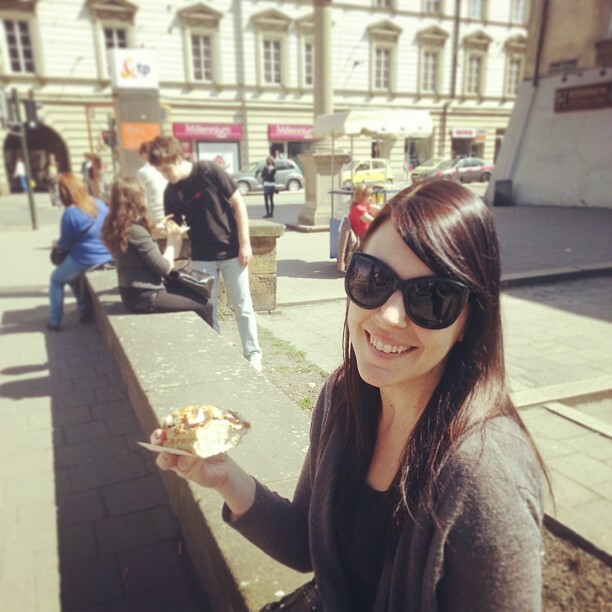 My name is Jessica Kaitse, and I’m a 29 year old Web Designer and quasi Web Developer from one of the most remote capital cities of the world; Perth, Western Australia. I wish I could tell you an exciting tale of how I wrestled with sharks and overcame death to get where I am, but that would just be an incredibly exciting and yet, blatant lie. I created my first website at the age of 12 with the ever trusty Desktop Publisher. I scored my first freelance job at the age of 14 and have been churning out websites ever since then. I’d say that I’m lucky to have figured out my passion at a young age, and I even studied web design and development at University. Designing websites was something I fell into. I’d always been a creative kid, and websites was just another medium to add to my creative arsenal. A self-motivated learner, I taught myself HTML and CSS. The principles of good web design were in its infancy, and Jakob Nielsen was my fearless leader. With each design, my skills improved. I was doing ye olde slice and dice with Photoshop and creating the websites in Dreamweaver. When I entered into a Web Development degree at University, it came in handy. But the general disorganization and lack of inspiration in my course only motivated me to learn more. That is the one thing I’d learn time and time again, especially in this industry; you better start swimming, or sink like a stone (thank you, Bob Dylan). I’d always been searching for a CMS that was powerful and flexible. And in all seriousness – could help me deliver my website assignments on time. I decided to use WordPress after seeing the name pop up in multiple searches. I wasn’t a developer, but I was willing to learn. I had grappled with Drupal, but it was almost impossible to me. WordPress allowed me to create a usable website that functioned the way I required (even if this was before the days of the “pages” post type), and looked great. My experience with WordPress was so positive , that I used it for all my assignments. I’ve now been using it for over 8 years. I use it wherever I can, and for almost every client. Often times, I create a theme based on detailed specifications. Other times, I’ll be able to hack a theme, plugins and pages to be able to create exactly what’s required, which is fantastic when I’m working to a deadline. One of my favourite things about it is that it makes websites less scary for my clients. They can go in and see that editing the content of their website isn’t as complex as it once was. And if they break something, it is easily fixed. My self-taught WordPress expertise helped me land a job straight out of Uni, at a well-known ISP. Since then, I’ve enjoyed a nice mix of 9-5 and freelancing. 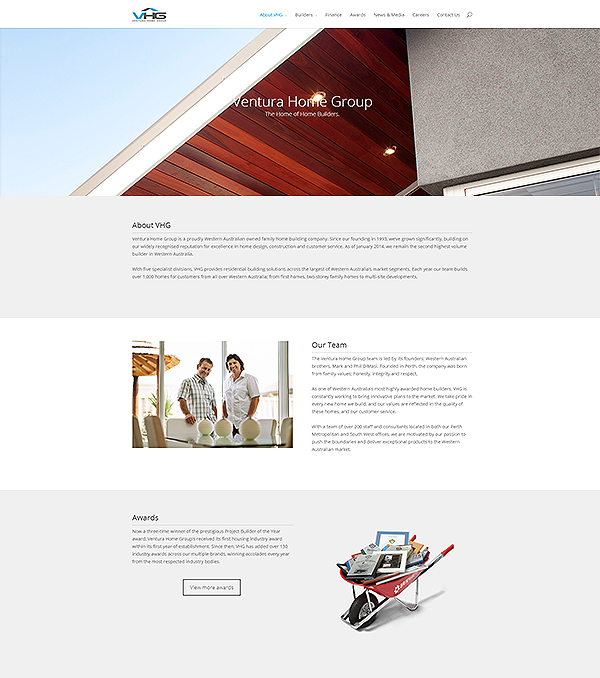 Working to a strict deadline played a huge part in creating the website for Ventura Home Group. Within my first week of employment here, I had been thrown into the deep end with a looming deployment date for the new website. It had to showcase all of our builders, allow for team members to easily update content and most importantly; be responsive. I began searching for themes that could do exactly what I wanted, but were flexible enough to be changed. Divi was the answer and I went to work straight away. I was able to get the website completed in record time. The director was incredibly pleased with it all – from the look and feel all the way down to the functionality. I’ve been receiving positive feedback on the website ever since. Over the years, WordPress has shaped me as the designer (and quasi developer) I am. Even though it is robust and powerful, it also challenges me and motivates me to continue to learn. I have quite a few website redesigns on the horizon here at Ventura Home Group. Each of them will be created using WordPress. Jessica is a 29 year old Web Designer and quasi Web Developer from one of the most remote capital cities of the world; Perth, Western Australia. She just re-built her company website using our Divi theme. So great to hear success stories through WordPress and Divi! I know that I’d still be struggling with my website if it weren’t to ET and Divi…. that being said, I know I have a lot of work to do still, but the road is paved and full of possibilities! Great stuff, Jessica! Keep up the great work! Elegant Themes is a great community! It is nice to know that not only are there great themes to pick from … there is great support also. I can also so that the themes are generally very sound, good security, good coding & fairly nice speed straight out of the box. 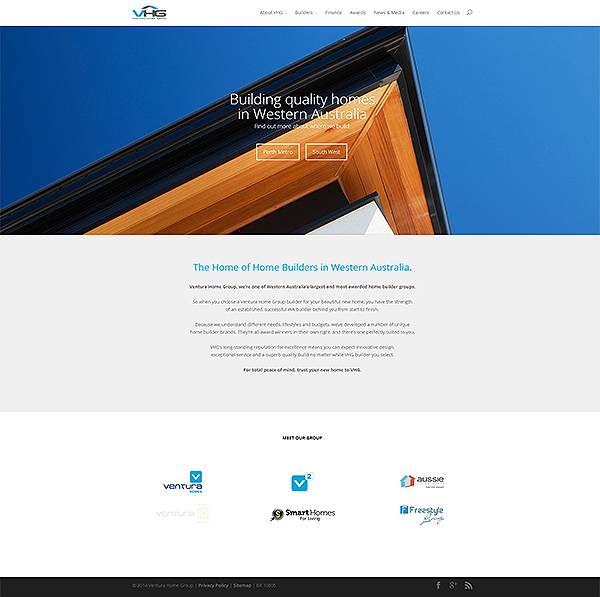 What a beautiful, clean website you created for VHG! And great job putting it together so quickly! I love the customer spotlight posts. I was hoping to get some more details out of this one in regards to actionable items I could use to design in Divi quickly and instead I just got a brief mention that “It was really fast to design my project”. I would love to see someone break down their process. Hey man! For me, my fast-track process begins with adding the pages I need (home, about, blog, contact, services, etc.). Then I use the Divi page loader to get me in the ball park. From there, drag-and-drop the modules I need. Finally, I customize. Divi 2.5 has an amazing UI for developers who want to tweak the out-of-the-box theme, but there are fields for adding custom CSS everywhere. I’ve never had a client do anything less than gush with excitement when I show them the finished project, and it only ever takes me 3-4 hours. I use Adobe Typekit for fonts and Adobe stock for photos; that’s important. And I’ve found that the easy-peasy parallax effect is great for the wow factor. Maybe it’s would be better to compress a bit homepage slider background? (1,1Mb). Glad to help! We, people, always miss something )) Good luck in you further projects. What is your contact info to find out how much you charge for your web design services? I can navigate DIVI pretty well, and write my content, but would like some handholding/idea bouncing and a developer to “put it all together”. Thank you! Lovely story & beautiful work. Thanks for sharing. Hi Jessica, your work is impeccable. Beautiful pictures and a very clean design. Thanks for sharing your experience with us. You make us grow. I love this design. It is extremely minimalist and clean, leaving room for the things that matter. I also use divi on my website and I can’t wait for 2.0 to come out. Yet another story about how WordPress has changed the world. Divi is an amazing theme, and you did some amazing stuff with it! Thanks for sharing your work, it’s given me many inspirations. Love the cleanliness and simplicity of your design. Divi is absolutely amazing for a web development platform. Are we still going to hear about DIVI for a long time to come? It makes now several months there have been no other theme developed here and all what we learn is what we can do with DIVI. Seriously guys, is that the new way you are planning to run this business – one theme a year? Our plan to is to make truly amazing themes that push the boundaries. We already have 87 great themes, and our new goal is to spend more time on the new themes we create to make sure they are the best themes on the market. These themes take much longer to create, but they add much more value to our membership that if we were to create a new theme every month. I love the Divi theme but there is too much space between modules. How do you minimize the excessive space between the modules? I found with the latest update of Divi, you can place an ID or class on each row and reduce the padding easily that way. It is still a bit of a manual process, but it’ll work. Can you explain that (your ID and Class workaround) in more detail as if to someone slightly simple-minded, please? Your approach is interesting but the danger here is that you create a sort of saturation when hearing about this single theme every now and then. I agree DIVI is a great piece of achievement but I don’t think it fits all needs. A sort of diversification would be welcome from time to time, even with more modest/simple themes. Are there any tutorials on working with Divi? I just downloaded it and am a little overwhelmed. Since I’m not a developer, I feel like there are things the theme could do that I’m missing out on. Make sure you look at the help files ET offer. There may also be other helpful info. I found this which may help you. There is other info out there. Little bit of a learning curve around DIVI but it is worth the effort. Great work Jessica. Love hearing your story. Hi also .. from Aus. I agree focus on quality over quantity and there are only so many variations of boiler plate designs you can come up with anyway. On the other hand Divi is more like a theme designer tool and for me this makes it far more useful. You can create many different web sites, all very different using the one base theme – there is your theme a week if that’s your want! In software engineering we call this being ‘extensible’ and moving forward you will probably find this model easier to support and maintain. Rather than having hundreds of different themes and trying to retrofit new requirements such as responsive design and new versions of WordPress you can focus your efforts on a small number of extensible themes. Jordan, DIVI is a theme that can do anything imaginable if you have the talent to think it up. There is no need for any theme other than DIVI because DIVI can literally do everything. I have pushed and twisted this theme well out of it’s comfort zone to accomplish things previously impossible and I’ve done it fast and gracefully. DIVI doesn’t confine you to a box and as soon as you can learn to think outside of the box your obviously accustomed to, beautiful things can happen. Nice work Jessica and Nick, you’re my hero. I definitely agree that Divi may be the only theme you need. It’s extremely customizable and easy to use. ElegantThemes support is great and has been getting better each day. Did you use a plugin for the sitemap page? If so would you be able to share which one it was that you used. The plugin used was WP Sitemap. I too use Divi both for design my personal site http://www.marcomottadesign.it ,and also for my new Clients! just in this time i’m using Divi on two new website i’m building! Great personalization, and i hope new release coming, will give us more possibility of menu and header personalization. Good work at all and thanks Elegant! What a smart and wonderful site is marco motto design. Question: how have done this great header? Great looking site, Jessica. I especially like that huge hero image on the Home Page. How were you able to change these static dimensions? I love the site and the theme but around about 12 seconds loading time are a blast into the wrong direction. This way you will never get clients, they are not willing to wait more than 3-4 seconds, with a tendency to wait less long every year. Nice article…. How did you get TWO buttons on the front page in the slider? I have been using Elegant themes for a few years now with pleasing results. I think you have outdone yourself with Divi. I have installed it on one site and will be using it on a few more including my main blog. I am also recommending it to clients. There are so many easy to use and useful, features. Krakow 🙂 I lived there for 16 months. Yes, you can thank our trusty IT department for the fact the website constantly goes down. I agree with the title of this blog post – beautiful – record time. Somehow I found out about Divi. I was blown away, immediately. It was everything I wanted! I renewed my ElegantThemes membership and my site was done within just a few days. Good question, especially given the pain and confusion that is Themeforest theme licenses, not to mention the support issues that come with most other themes and frameworks. I do a lot of work for clients with Themeforest and Genesis themes. In the past I even tried Headway Themes, Weaver, Hybrid Core…so much time and so many dollars and never satisfied! Until now. I love Divi! Just started working on transforming my genealogy blog to the Explorable theme. Then the biggie – the travel blog. Lots of work, but fun! I love DIVI. But what about breadcrumbs? Did You forget about breadcrumbs in this theme? No breadcrumbs on the Divi theme? Using Divi for the first time and really disappointed; it’s not living up to the hype for me? Today I discovered – no breadcrumbs??? Nova is my favourite elegant theme, very impressive! Does anyone know a good code for the breadcrumbs in the Divi pagebuilder?? – Maybe thru the html insert? *** Is Divi 2.0 a good/excellent/bad idea for a WP newbie to create a site ??? I am starting my own business. I am a longtime skill PR/Marketing lady and I am starting a very vertical Marketing business. Clients already in place.. I may or may not build other sites but my own, but … I know what I want and am compelled to build that site to best represent my *attitude and aptitude*. I have sites in mind to emulate. I have small window of 2 weeks to build that site. Then, onward to starting my business. Excitement overwhelms me! If you do not think Divi 2.0 is indeed for WP newbies, please be honest in your reply. Funds limited, so cannot scrap one theme for another. Many love to brag about building ease, no coding needed, blah, blah, blah. Love your story. I completely feel your pain. We share similar stories. You, too, are seemingly self-taught in WP. I admire what you have accomplished! Please let me know what you think. Thanks! Await your kind and prompt reply! Blessings to you!